Kino Teens from six southern Arizona high schools participated in the last year’s Walking in Mercy Youth Summit. As we begin a new year, two important annual KBI events are on the horizon—our Walking in Mercy Youth Summit and the Phoenix Fundraising dinner. We share more about them and our December immersions. And we are so grateful to announce our 2018 donations and fundraising totaled over $1.5 million. Thank you for your generous support! 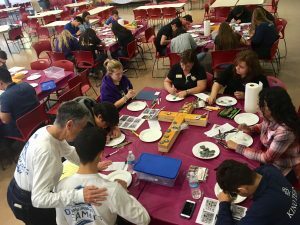 Walking in Mercy Youth Summit: The Fourth Annual Walking in Mercy Youth Summit, sponsored by the KBI and Kino Teens, will be held at St. Augustine Catholic High School in Tucson on Saturday, February 2, 2019. Drawing high school students from various schools in Phoenix and Southern Arizona, the afternoon gathering engages participants in discussions about border realities and challenges for the undocumented; provides opportunities for community prayer and collaborative projects; and offers students ways to support undocumented students and families in their communities. Phoenix Dinner: Mark your calendars now for the Ninth Annual Kino Border Initiative Dinner in Phoenix on Saturday, March 9, 2019. This event brings together friends of the KBI to acknowledge the vital work of the KBI and raise funds for it to continue. More information about the event and purchasing tickets is available from KBI Associate Director Javier Fierro in the KBI office at 520-287-2379 or jfierro@diocesetucson.org. Updates can be found at: https://www.kinoborderinitiative.org. Immersion Experiences: In December, the KBI hosted a group of rabbis from across the U.S., and a students and teachers from Boston College. 2018 Fundraising News: The KBI is pleased to announce that, with the support of our generous donors, we raised over $1.5 million in 2018! In addition, we received contributions from 1,584 new donors. We are so very grateful to our dedicated donors and supporters! You make our work possible!